Canaste: (CAN a stay) An alseid in Arkwood. Canaste is the only redhead in the Charm. Along with most of the other alseids in Arkwood, she victim-shames Eunoe for an incident that once happened with the satyr Elson. Though the details are not explained in Elf Mastery, Canaste and the others were the reason that Eunoe left Arkwood for Equinox, and the reason they were hesitant to return. Carmin: A woman for whom Marik Esilgard has an obsession. A former love, he makes a deal so he can forget her, yet also carves the hilt of his sword so he can remember her. Castor: A flying white tiger crafted by Eunoe. The concept for Castor came from a picture of a white tiger in the Withers' home, and Eunoe has an obsession with giving her creations wings. 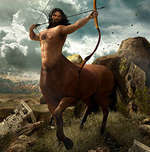 Centaur: From Greek mythology, a centaur is a half-man, half horse. The depiction is usually of a human torso on a horse body. Elf Mastery depicts centaurs in this manner. Chaos: In Greek mythology, the first being and the father of Nyx and Erebus. Chaos was described as a mixture of elements, and a shapeless heap. In Elf Mastery, Chaos was pushed aside as other beings came into creation and desired Order. This led to a war between Chaos and his followers, including Nyx and Erebus, and the followers of Order. Chaos and his allies lost and were pushed out of their home and came to form what we now know as the Oort cloud, where they have dwelt for eons. Chaos has been put to sleep with powerful magic, and the stars put in place should he or his followers make an assault against the World of Order, as they have done many times in the past. Tales of the threat of Chaos permeate society, and he is considered the iconic villain, much as we might view the devil. Charm: A group of nymphs. While not all nymphs live in groups, and not all those who do use this term, it is common among the alseids to refer to their communities in this way. Chief Groundskeeper: A stern but diligent elf-type man with blue skin. He is unnamed in the book, yet makes a few appearances. He works hard but has rigid values and a reputation as a tough nut. He is Kyla's first contact on her arrival at Equinox, and deflates her hope that she would be greeted with kindness and warmth. Chiron Science Center: The science building at Equinox, named for the famous centaur from Greek mythology who was renowned for his intelligence and skills with medicine. Crab-apples: Often written crabapples or crab apples. Small, sour apples. In Elf Mastery, this is a vile curse word among Elves, so Kyla really has the mouth of a sailor among her own kind. Whereas modern English curse words are scatological or sexual in nature, in languages such as French (and maybe even more so in Quebecois) curse words are often religious in nature. (This was also true in English, though culturally the impact of religious cursing has largely been lost). Among Elves, swear words, or cursing, stems from foraged foods that the Elves find problematic, the primary curses being crab-apples, because of their sourness, and pine nuts, because of the difficulty in obtaining them. Cytosine: A nucleobase which attaches to deoxyribose as part of our DNA. One of the four primary bases in DNA structure. In Elf Mastery, cytosine is a black bead used by Eunoe in her knitting to create animals. In both reality and in Elf Mastery, cytosine is placed opposite guanine.